I did plan on using a round nozzle for these cakes, but it just didn't look right. Mother's Day had to be about frills and flowers. I also found that the best yellow colouring is... (dramatic drumroll) Asda's own natural yellow in liquid form. 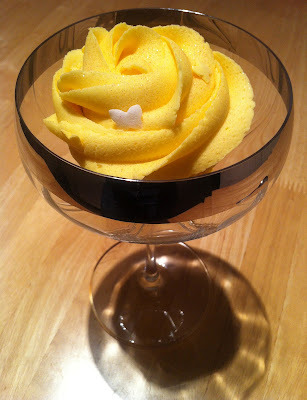 I found this after a near buttercream disaster with yellow colour paste which turned the frosting a sickly shade of peach! Not the look I was going for. I was thinking daffodils, not cobbler. Cream the butter and sugar for about 5 minutes. Mix the milk, lemon zest and extracts in a jug. Add half of the milk mix and half of the dry mix to the creamed butter and sugar. Do this carefully with a folding action. Repeat until all the mix is incorporated. Do not beat the devil out of it. You cakes will be like old boots. You spent 5 minutes whisking air into these little beauties, don't spoil it. Divide the mix between 12 cupcake cases in a muffin tray. These are nice and deep and will give your cakes a straight side. Bake on gas 4/180C for about 30 mins. You're looking for a well risen bun with a golden top. Allow the cakes to cook completely before frosting, otherwise you will eng up with a melted mess. Mark my words. Beat the butter for about 3 minutes to soften it. It will look considerably paler than when you started. Add about a quarter of the icing sugar and mix by hand with a spatula. This will prevent your kitchen being redecorated. Add the lemon juice, the zest and the rest of the icing sugar and mix again by hand. It will be quite firm. Using an electric hand mixer, beat it for about a minute on a medium setting. This will incorporate everything nicely. Add your desired colouring (if any). Beat on a medium to high speed for about 5 minutes. I know this is a long time. It's time well spent. If your kitchen is very warm, you may need to pop the frosted in the fridge for 5 minutes or so. This just makes piping easier. This is really down to personal taste. I used my nozzle of the moment (Wilton 1b) but used it quite loosely to create a bit of a ribbon effect. I also used a bit of edible orange glitter over the frosting before covering the cakes in either small Dr Oetker butterflies or large sugar daisies from Just Bake. I used pink and yellow spotty cupcake cases from Morrison's. I gave mine to my mum and grandma in pink spotty cupcake carriers from Sainsbury's (£2.79 for 2).